Many of us can recall a time when we were hurt by someone else’s actions. But we likely all can remember a time when someone’s words hurt. Words bypass race, size, religion, gender, class and strike right at the heart of us, often before we know it. Gossip can catch us off guard, and broken telephone can contribute to us being hurt when we hear things behind our backs. Hearing your BFF actually hates your new dress but tells you how flattering it looks to your face because they know how much you like the color & they don’t want to hurt your feelings… still hurts when you realize they withheld the truth from you when asked for it. Sometimes we don’t know the other person well enough to not accidentally make a comment slip (like how you dislike Timmy’s coffee and it turns out to be their favorite daily coffee place) and hurt their feelings. Be careful what you say when you don’t know all the facts or people in a situation. Ask God for wisdom to help you steer clear of unintentionally using words that hurt. When we hear an accusation, we are all initially hurt: either by the truth, or by the lie. The truth can pack quite the wallop when we are hiding from it, can’t it? There have been times when I need to catch my breath from its jab. The point of these words is to rebuild & restore us, despite the surgery that may be involved uprooting what shouldn’t be within us. Unfortunately, the delivery method can pack as much of a punch as the words spoken. When God speaks the truth to us, whether in His word or through another follower, it might be blunt but it is to be delivered with love and a desire for God’s best. Not the judgment that tends to slip out, which reveals the state of our own hearts. Which leads me to the other way that an accusation can hurt: when its a lie. You know, “lie” is a word I prefer not to use, because I like to lie down to rest, and I don’t like to use words in two ways when I have an options. Lies as a plural, is perfect. As a writer, word choice is important to me for setting the right background or revealing the best picture. Falsehoods hurt because of their design. They are enemy snipers designed to take us down any way they can. When they are used by a non-Kingdom dweller, we aren’t as surprised, for we know who they are aligning with by association. When falsehoods are used by a believer, a tear forms in the fabric of the Kingdom, and a tear falls from the face of its Leader. Brothers and sisters, whatever is true, whatever is noble, whatever is right, whatever is pure, whatever is lovely, whatever is admirable —if anything is excellent or praiseworthy —think on such things. Fill your minds and meditate on things true, noble, reputable, authentic, compelling, gracious—the best, not the worst; the beautiful, not the ugly; things to praise, not things to curse. This reveals more about the character of the speaker than the hearer. Because you KNOW your word will hurt. And that knowledge means you purposefully are aiming at another person to wound them. I have been the recipient of deliberate, calculated falsehood in a time of great loss or shock, from those I adored. Although I have forgiven them, the scar remains. Those deliberate words? They are the bombs to the single gun shot of unintention and the Uzi of accusation. 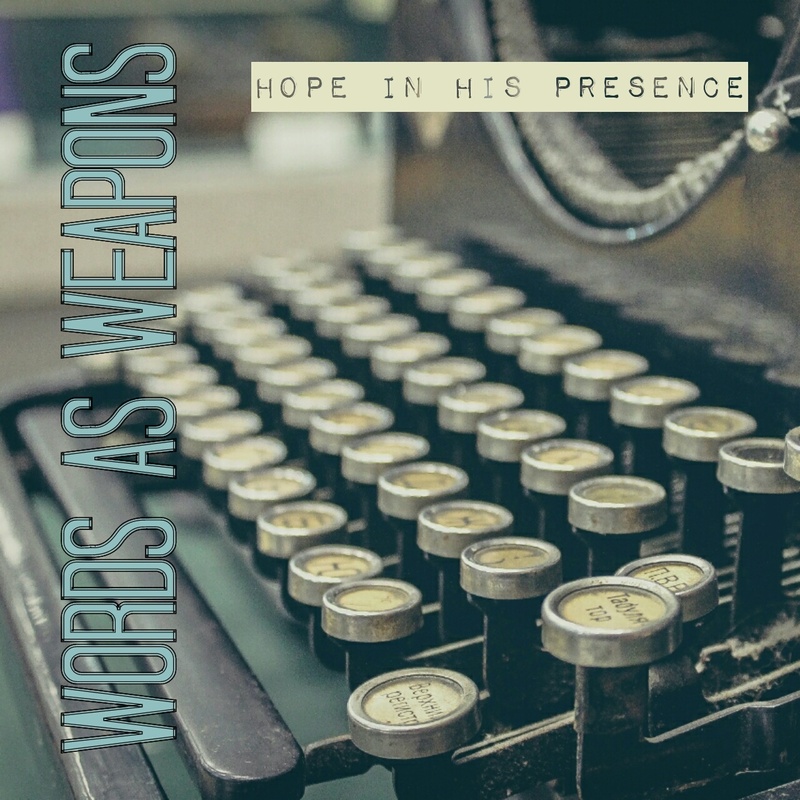 All of these wound causing word weapons can come with a complication. How it impacts our relationship with the speaker of these words. We need to run to God first to ask Him to separate how we have been hurt from the person who hurt us. Once we have dealt with the wounding, then we need to ask Him how we are to speak to the wounder. He may reveal an insight we could not know, and have us either set up a new boundary or reinforce our friendship, addressing the situation from His perspective. Words hurt, but in His hands we can be fully healed. Previous called to go, do or be? I have to watch my words and repent! thanks for this post!